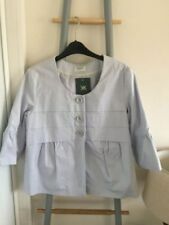 Minuet Petite Bolero Jacket Size 12 New. A very smart Elegant looking Jacket/ Bolero. 3/4 lenght sleeves. womens faux fur coat size 10. Condition is Used. Dispatched with Royal Mail Signed For® 2nd Class. This is a gorgeous Kaliko jacket which would be suitable for any occasion! It has been used, but has no signs of use (slight discoloration to Kaliko label inside) - grab a bargain! Features include. Size UK10Donation. 50.00% of this sale will be donated to charity as chosen by our generous donorItem SKU. Material: Blend - woolCondition. Ladies Jacket Size 14 Kaliko. Condition is used but is in excellent condition. Very smart brown/beige pattern. Very flattering fit, lovely neckline. From a pet free and non smoking home. Kaliko 12Black Quilted Coat. Lightweight Stylish Shawl Collar. Superb c o n d i t i o n. Filledz ip pe d wi th t wo o ut er z ip pe d po ck et s.
Jacket is shaped and looks good with either trousers or over a dress or skirt. Shoulder to hem 19". Armpit to armpit across 20". 100% Linen Jacket beautifully tailored by Kaliko. In excellent condition. We love our clothes, look after them, and buy the best we can afford. It is in excellent condition. It has been hanging in the wardrobe protected buy a plastic cover. There are a couple of small pressure marks, usual for silk velvet, which will steam out. Jean Jacket Size 12. Condition is Used. Dispatched with Royal Mail 2nd Class. Lovely pinkBolero /shrug jacket 14 used. Condition is Used. STYLE - Gorgeous jacket in black with a bead & sequined embellished scoop neckline elbow length sleeves sprinkled with tiny beads and a cropped style fully lined and fastens with one press stud at the neckline. Gorgeous lined jacket with attractive buttons. In excellent condition. Measures 21.5” from back of neck to bottom edge and 18” from armpit to armpit. See photos for very slight signs of ‘pulling’ on the back seam. Condition is Used. A short fitted woollen blend jacket with four buttons. Fully lined with an olive green lining. Sleeves are long, can be turned up to show lining. Jacket style is short, fitted tweed with a v-neck collar. Sizelabel says - UK18. Kaliko Pure Linen Jacket. Frilled front and peplum. Three quarter length sleeves. top of shoulder to hem - 24ins. FULLY LINED. Condition is Used. Kaliko pure linen jacket with 3/4 sleeves. AP-AP 22" length 24" from top of shoulder. BNWT Beautiful quality Kaliko orange/red 3/4 sleeve jacket. Single hook fastener at front. Fully lined. Size 16 but quite small sizing, more like size 14 in my opinion. I have 2 Kaliko dresses that match this jacket for sale. 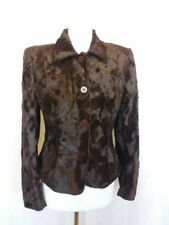 KALIKO LADIES BLAZER SIZE 14 UK, HARDLY BEEN USED, IN EXCELLENT CONDITION. Fully lined Orange jacket with a very small herringbone pattern. Ladies Kaliko Yellow Lined Jacket size 14. 3/4 Sleeves. 3 Large Buttons at front. Condition is Used. Dispatched with eBay delivery – Shutl 1 day. Kaliko 10 jacket, grey pink lining belted, same colour buttons great condition, 3/4 sleeve with 50s style collar and button front, belted with pink lining. Belt has sewn bow effect with press stud operation. Never worn, bought for wedding which was on a hot summer day so didn't wear jacket. Very fine soft material. Buttons To Fasten. Colour: Grey Mix. Material: 55% Wool, 22% Acrylic, 18% Polyamide, 4% Polyester, 1% Other Fibres. Lining 100% Acetate. Oversized Collar. Length From Back Of Collar To Hem- 31.5". Fully Lined. Ladies Kaliko Linen Fitted 3/4 Sleeve Summer Weight Blazer Jacket Sz 8 One button through with fitted shape Dainty gathered detail at shoulder 3/4 Sleeves with button detail on each cuff Two front pockets Back vent 100% Linen fully lined (lining is polyester) Shoulder to hem 28” Armpit to cuff 12” In superb condition Any questions please ask. I always list my items honestly & would not list anything I wouldn’t be happy to buy myself. Thankyou for looking! KALIKO 100% silk Dress size 12. Never worn. Condition is New with tags. 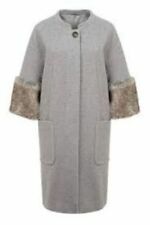 Beautiful and stylish ladies Kaliko natural colour coat with detachable faux fur collar size 16 never worn in excellent condition. I paid £179 for this coat 2 years ago and it has always been in a dress bag and never been worn. Postage costs are higher due to weight and size of coat. Lovely spring jacket from KaliKo. colour is a pale lemon floral. button font. fully lined. two front buttons. • Short-3/4-long Sleeves. • Size 12/M. Here is a stunning waistcoat from Kaliko. Burgundy red with goldy beige flower print. Underarm to underarm: 50 cm. Length from shoulder to hem at the front: 51 cm. Waist: 42 cm. Kaliko Fleece Waist Coat. With Faux Fur Trim. colour beige. Fab Ladies blazer, occasion jacket. Size UK 16. BEIGE TAUPE AND GREY. FAUX FUR DETACHABLE COLLAR. Good quality and excellent detachable faux fur wrap collar. SMART COAT. SOFT AND WARM. 3/4 LENGTH JACKET / COAT. Two-tone beige/grey coat. FEATURE ZIP POCKETS. Size 5 shoe. I am slowly but surely clearing out bags, shoes, clothes ext. If only to replace with more! It will arrive ready to wear. Green Velvet Silk Ribbon Tied Ladies Jacket by KALIKO, UK8. Green Velvet Silk Ribbon Tied Ladies Jacket by KALIKO, UK8.. Condition is Used. Dispatched with eBay delivery – Shutl 1 day.